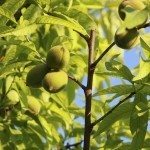 My Elberta peach tree produces tons of fruit each year, but most of it falls off while still a little baby peach. What remains gets these places on the fruit that oozes sap like stuff, then the peach dies and falls off. I am so heartbroken. Can you please tell me what's wrong and what to do about it?